The Wright Wreport: Neshobe River Winery: A Wicked-Good … in Vermont! Neshobe River Winery: A Wicked-Good … in Vermont! 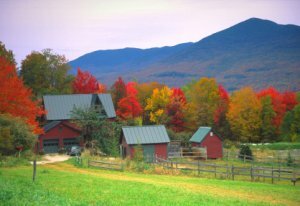 Visitors to Vermont can drink in more than fall foliage with a trip to a winery. Photo courtesy of Leaf Peepers. Who woulda thunk it? That’s Vermont. Full of quirky little surprises. Imagine my surprise when a wine called Purple Haze proved to be far superior to the lighter-fuel, rot-gut hazy hangover its name seems to foreshadow. Purple Haze. Created in the same year as the 40th anniversary of Woodstock. Did I ever get the reference wrong! But to be fair, the label does say, “Relive the experience Woodstock 1969-2009.” I was thinking one would have to re-live the experience, because just how many who went could actually remember it? And, who in the world would have the audacity to evoke such an iconic rock legend and slap its name on a wine bottle? Enter the Foley family, and Bob Foley, Jr. in particular. A short six years ago, BF got it into his head to start the Neshobe River Winery (http://www.neshoberiverwinery.com/about_nrw.html). One son, Patrick, had already embarked on a winemaking career, learning the trade in California, South America and South Africa. The lessons must have stuck, and one lesson in particular: respect the grape. 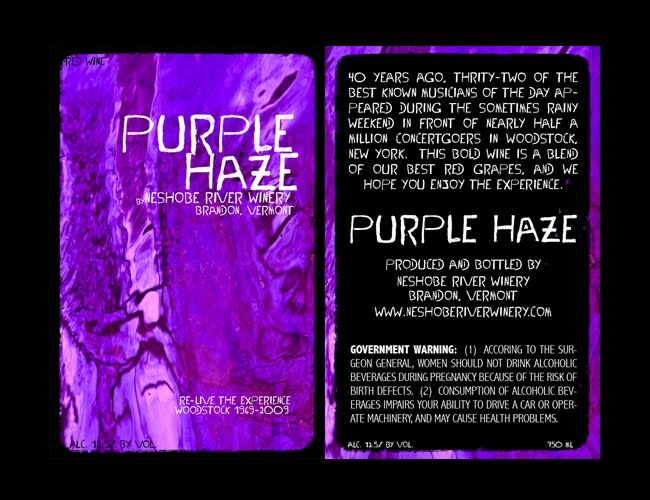 Label of Purple Haze. The wine is Neshobe River Winery's new take on an old Jimi Hendrix classic song. Photo courtesy of Neshobe River Winery. The tried-and-true, run-of-the-mill varietals simply will not thrive where the ground is wet and the climate is cold; their wines suffer, if one can call them wines at all. Staying true to Vermonters’ passion for supporting local agriculture, BF and other local vintners turned instead to grapes that thrive in the region. Ever heard of Frontenac? Neither have I. How about Traminette? Not so much. St. Croix and Marquette? Ditto. Many of these grapes are kissing cousins of varietals from Northern Germany and Northern France – also wet and cold climes. 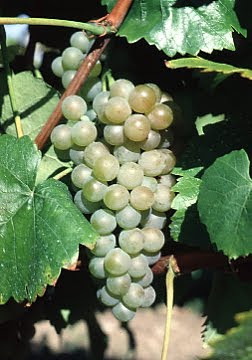 The Traminette grape is derived from the German Gewürztraminer. Photo courtesy of Cornell University horticulture department. Depending on whether one speaks with Vermonters or academic viniculturists, there are two distinct stories about the origins of these grapes. On the one hand, the romantic Vermont version is that French explorers tried desperately to plant the vines of their homeland in North America. That didn’t work. Then some explored producing wines from the wild grapes grown in the region and others spliced in grafts of French vines, creating hybrids that after hundreds of years have become, well, not exactly indigenous, but pretty darn close. From these wines come innovative Vermont wines. On the other hand, university horticultural experiments of the past 20 years have developed hybrids specifically to develop or enhance varietal characteristics. SPOILER ALERT: That delightful little Traminette? A derivative of Gewürztraminer developed in 1965 by H.C. Barrett at University of Illinois (New York’s Food and Life Sciences Bulletin, No. 149  http://http://www.neshoberiverwinery.com/about_nrw.html). Marquette? Developed in 1989 by Peter Hemstad at the University of Minnesota (Vitis International Variety Catalogue (VIVC) Datasheet, , http://www.vivc.de/datasheet/dataResult.php?data=22714). Frontenac? Also another UMinn product, released in 1996 (Frontenac Enology, , http://www.grapes.umn.edu/frontenac/enology.html). Who knew that two NCAA Big Ten schools could produce great grapes as well as great football? 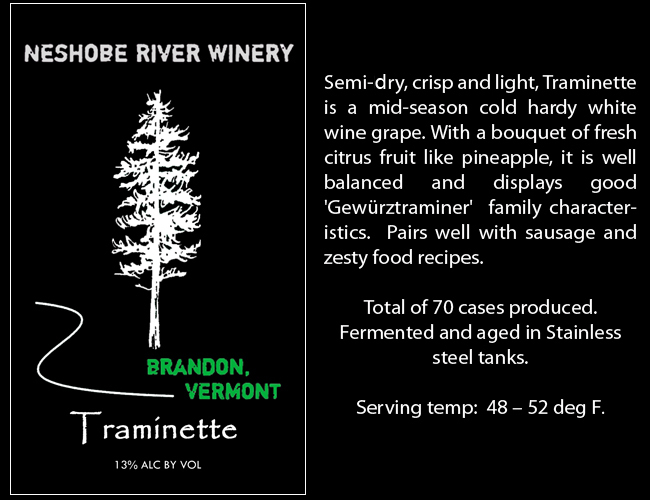 Label of Neshobe River Winery's Traminette. Photo courtesy of Neshobe River Winery. Now before anyone goes and has a kitten about genetic engineering, keep in mind that the millennia-long history of viniculture is all about genetic engineering: hybridization, grafts, etc. These forms of genetic engineering are quite traditional – and quite apart from today’s genetically modified plants wherein DNA material from one species is injected into another. This is not that. Breathe. Pour a glass of Vermont wine. Relax. The point is simply that laboratory science has facilitated traditional winemakers in developing varietals that thrive in the cool, wet weather of northern New England and Canada. Such varietals have begun to flourish in these regions, and the wines they create are distinctive. By respecting the grapes that the climate supports, Vermont vintners are beginning to develop a truly regional wine. For its part, Neshobe River Winery is elevating the cultivation of these grapes to an artform. Out of such quirky little varietals delicious, full bodied and unexpectedly complex wines emerge. 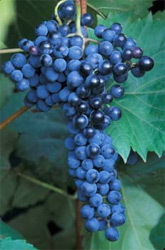 The Frontenac grape was created in a test tube. 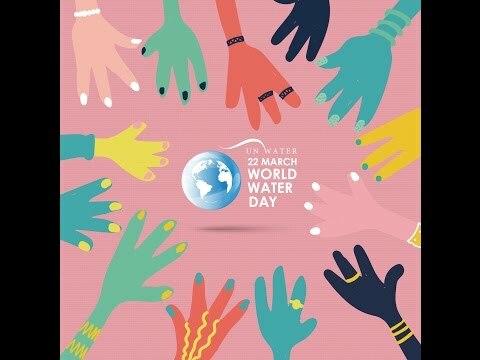 Photo courtesy of the University of Minnesota horticulture department. I first encountered Neshobe wines at A Taste of Woodstock, a high-quality but surprisingly affordable local artisanal outdoor festival one week before the floods of Hurricane Irene arrived in late August. Organic cheeses, hamburgers made from beef of grass-fed cows, handmade quilts and hand crafted soaps surrounded the wine and cider booths. Of the five wines that Neshobe produces, let’s focus on two: Traminette and Purple Haze. 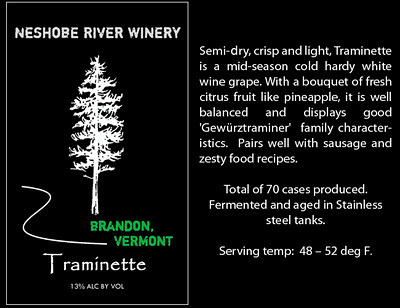 Mention that Traminette is Gewürztraminer’s kissing cousin and one might think a rather sweet white wine is on the horizon. Not so. Imagine a Gewürztraminer with a dry Riesling backbone: all the flavor is there with only a hint of sugar. This wine drinks well, unfolding with richness as the taste lingers for a moment on the tongue (smooth finish). Perfect for seafood and hearty cheeses. Sporting a T-shirt that reads, "Come out ye coward and fight the six of us" Bob Foley, Jr. holds down the Neshobe River Winery winetasting fort in Woodstock, VT. Photo by Tamara Fish. Take a walk on the wild side. Pure 100 percent Frontenac, the wine is an imp. Cloaked in a Zinfandel’s rich jammy-berry scent (completely fruity nose, strong), Purple Haze does a switcheroo: not a hint of sweetness at all while still retaining a sense of fruitiness. Take a Zinfandel’s hearty fruit-filled fullness (blackberry) and make it dry, dry, dry (not sweet). What a paradox! Don’t even think of drinking this alone. Purple Haze demands food. Good food, not munchies. Let Woodstock recede into that thick purple haze. This is a mature grownup’s drink. 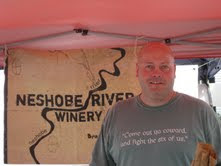 Curious about Neshobe River Winery’s other wines? Go and visit. Stay at the Foley’s Old Mill Inn Bed and Breakfast (http://www.neshoberiverwinery.com/media.html) in lovely Brandon, VT ... To purchase from this small very boutique winery, call BF directly at 802.247.8002 or email neshoberiverwinery@gmail.com.